From Termini station take the Metro A direction Battistini for 4 stops. Get off at Flaminio / Piazza del Popolo. 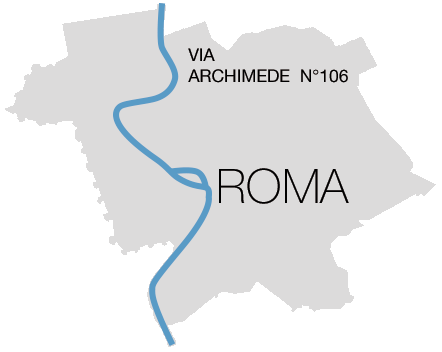 From Flaminio take the Roma / Viterbo line for one stop. Get off at Euclide. From there walk to Via Archimede up to number 106. With the Leonardo Express, a non-stop service to / from Rome Termini every 30 minutes (every 15 minutes in the hours with greater inflow of traffic) and 32 minutes travel time. With various bus companies located adjacent to the bus terminal to the outputs of Terminal 3 - Arrivals. Upon leaving the airport take the bus COTRAL / SCHIAFFINI every 30 minutes to Ciampino train station city with 5 minutes travel time. Then a regional train connects Ciampino railway station to Termini station in an average time of 15 minutes. With various bus companies located in front of the International Departures.